Maryland Baptist Aged Home, a nonprofit corporation in Baltimore, specializes in providing assisted living care to long-term residents. Its total of 29 certified beds makes it considerably smaller than the nursing home average. This facility does not reveal much about itself on the Internet, which raises some questions in our minds. But these little non-profit religious affiliated nursing homes you can usually predict will be pretty decent (or at least score well with Medicare). Maryland Baptist is no exception. Medicare gives it an overall 4-star rating (above average), and based on what we can learn about it, Maryland Baptist Aged Home does appear to do pretty well by its residents. We could not find a website for this facility, so we called them. A staffer gave us a website address that didn't work. Maryland Baptist seems to be affiliated with the United Baptist Missionary Convention & Auxiliaries, a national organization; but we are not sure of the nature of the connection. From what we can discern from the U.S. Medicare data and other websites, however, this facility does specialize in providing assisted living care (according to an outside source, Assisted Living), and (according to another outside source, Wellness), it "provides extended-stay nursing care to seniors with varying levels of disabilities." We know one other thing about this nursing home and it is not good. In 2013, a staff member was convicted after mistreating a resident. The employee directed a 53-year-old male vulnerable adult resident to sit in a chair because the resident appeared agitated. Inexplicably, the employee then pinched the resident on the chest with both hands. Other employees saw what had happened and, to their credit, they called the police. Was this criminal act Maryland Baptist's fault? It is impossible to say. Sometimes nursing homes make what appears to be good hiring decisions at the time that end up being the wrong people. But is sure does not give you a warm fuzzy feeling. Crawford Retreat: This Baltimore facility's Medicare ratings are very closely comparable to those of Maryland Baptist Aged Home. Notably, both facilities get five stars for quality measures and a 4-star rating overall. Bridgepark Healthcare Center: With an overall 1-star Medicare rating and 1 star for its staff inspection, this Baltimore facility hardly competes with Maryland Baptist, which got an overall 4-star rating. FutureCare Sandtown-Winchester: The Medicare scores of Maryland Baptist and FutureCare Sandtown-Winchester are nearly identical - except that the Baltimore FutureCare facility gets a one-point better mark on staffing. Autumn Lake Healthcare at Alice Manor: Whereas Maryland Baptist is at least a bit above average in the Medicare ratings, (4 stars overall), Autumn Lake in Baltimore is a bit below average (2 stars overall). FutureCare Irvington: One of a string of FutureCare facilities in Baltimore, FutureCare Irvington is close to comparable with Maryland Baptist on the Medicare scores - better on staffing, less good on quality measures. Both facilities get overall 4-star ratings. Fayette Healthcare and Rehabilitation Center: This facility in Baltimore received Medicare ratings very similar to those of FutureCare Irvington, and it poses about the same nearly par level of competition to Maryland Baptist. Brinton Woods Health & Rehabilitation Center at Arlington West: Definitely an also-ran to Maryland Baptist, this Baltimore facility got an overall Medicare rating of 2 stars (below average) versus 4 stars for Maryland Baptist, which outscored it on the health inspection and quality measures. Northwest Healthcare Center: Northwest falls short of Maryland Baptist in all four of the main Medicare rating categories, including its overall score of 2 stars to the other Baltimore facility's four stars. Westgate Hills Rehabilitation & Healthcare Center: Westgate Hills comes close to on par with Maryland Baptist, but that facility edged Baltimore-based Westgate Hills on quality measures and overall Medicare rating. Caton Manor: This Baltimore facility's Medicare scores are so low that it hardly competes with anyone. It falls well behind Maryland Baptist in all four main Medicare categories, including its overall rating (4 stars for Maryland Baptist, 1 star for Caton Manor). It stands to reason that a facility specializing in assisted living would not have residents who plan on staying only temporarily. That would mean that all 27 residents here are of the long-stay variety. This would explain why the last standard Medicare inspection (October 2015) had practically no data on short-stay residents. For the Medicare category of quality measures (numerical measures of care), eight out of nine statistical categories for short-stay residents were marked "NOT AVAILABLE." Yet Maryland Baptist got a 5-star rating - tops - for quality measures. That rating is based on this facility's stats for long-stay residents. These stats were fantastic. This facility outscored the Maryland and U.S. averages in 11 out of 15 measured categories, and in seven of those categories, its scores were far better than the state and national averages. None of this facility's long-term residents had a pressure sore. None of them reported having serious pain. None of them needed ongoing catheterization. None of them were subjected to physical restraints. You can't do better than that for these categories, and Maryland Baptist totally bested the state and national averages each time. It was much superior in preventing urinary tract infections: the rate here was well under half the state and national rates. It was far more successful in maintaining its residents' continence - only 31.6 percent having lost control of bowels or bladder, versus the U.S. average of 46.8 percent and the Maryland average of 58.5 percent. Additionally, this facility's long-term residents were notably more able to maintain their mobility and their independence in conducting daily activities; and less likely to suffer a fall with injury or the loss of too much weight. The rate of depression among these residents was right about on par with the state and U.S. averages, but these residents were three to four times less likely to need antipsychotic meds. The only notably downward statistic here was for pneumonia vaccinations: only seven in ten residents here got the shots, versus over nine in ten statewide and nationally. Maryland Baptist did less well on two other main Medicare rating categories. It got a 3-star rating (average) for its health inspection, and a 2-star rating on staffing. The health inspection found a total of 11 deficiencies, a fraction better than the Maryland state average of 11.4, and a bit above the national average of 7.1. This facility slightly beat both the Maryland and U.S. averages on fire safety in terms of the number of related deficiencies. Medicare appears to base its rating for staffing (that is, nurse staffing) mainly on the amount of time nurses spend with residents. Maryland Baptist was lower than the Maryland and U.S. averages on total nursing time per resident per day (by a matter of minutes). It was very close to par with the state and national norms for daily time spent by certified nursing assistants and physical therapists. However, it was far lower than the state and U.S. averages for resident daily time with LPNs and LVNs (licensed practical nurses, licensed vocational nurses): only 18 minutes a day - just over a third as much as the state and national averages. This facility did get a 4-star rating for its RN staffing (which Medicare treats as a subcategory); this facility beat the Maryland and U.S. averages (albeit only by minutes) in terms of RN time per resident per day. Maryland Baptist has had no federal fines or payment denials in the past three years. It did have a complaint inspection in May, 2016, that investigated over half a dozen issues. However, all of these issues were very much the same in nature: Medicare cited the facility for failure to provide a resident's medical records to the family promptly; failure to update a resident's records; failure to maintain an assessment record accurately; a transcription error, etc. All of these complaints were administrative or clerical in nature: it seems that record-keeping is not this facility's strong suit. But compared with complaints that have arisen at other Baltimore nursing homes (for instance involving physical abuse of residents), the issues at Maryland Baptist were (we think) very minor. It is easy to find nursing homes in Baltimore that serve well over 100 residents, both short-stay and long-stay. In serving so few residents (a maximum of 29) and only those in the long-stay category, Maryland Baptist Aged Home is what one might call a specialized facility. They do not do everything here, but - based on their quality measure scores - what they do do, they do mostly well. Has someone in your family suffered needlessly at the hands of a nursing home that made a mistake? 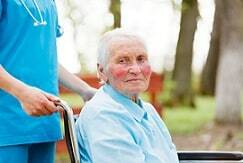 Call our nursing home lawyer at Miller & Zois today at 800-553-8082 or get a FREE no obligation case review.